Applications for the employment program are available at any of the 11 Cherokee Nation Career Services offices and are due by April 20. The six-week program kicks off June 11 and ends July 20, with participants working 40-hour weeks and earning $7.25 per hour. To qualify for the employment program, youth ages 16-24 must be a citizen of a federally recognized tribe and reside within the Cherokee Nation’s 14-county jurisdiction. 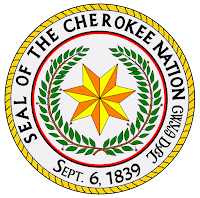 Cherokee Nation funds the employment program, and participants may be placed in a Cherokee Nation department or, with the tribe’s assistance, could find work in a public school, library or private business. 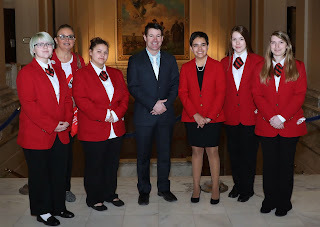 Applications are also being taken through April 20 for the Summer Youth Leadership Intern Program, which provides young adults an opportunity to become familiar with Cherokee Nation government and administrative functions. 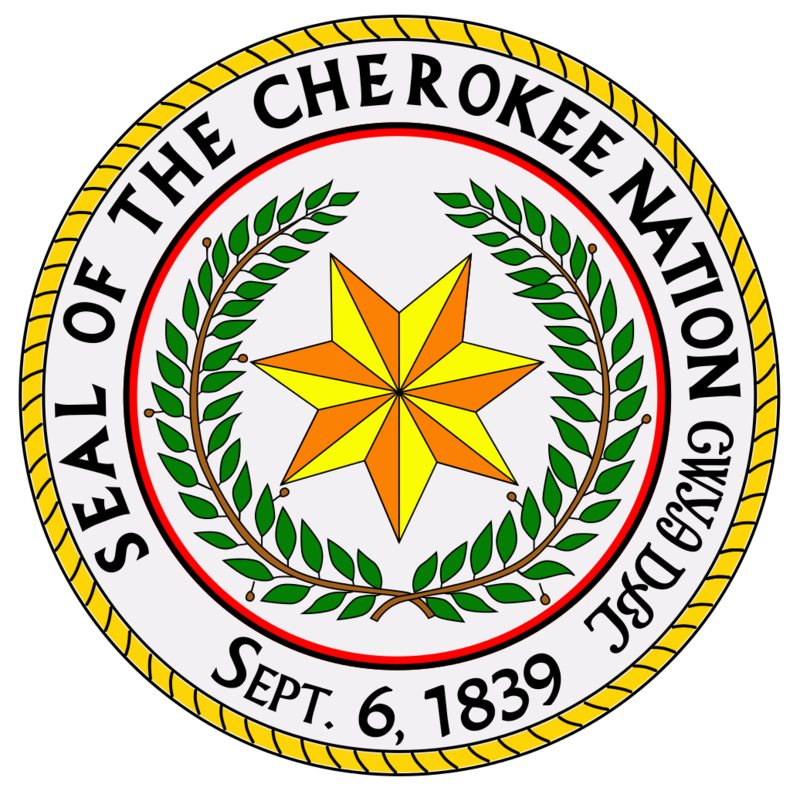 Only about a dozen Cherokee Nation citizens ages 18-21 will be selected during the competitive application process, which includes an interview. The program begins June 4 and ends July 27. 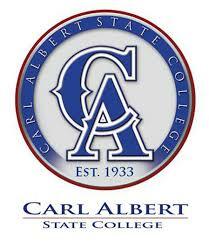 Applicants for the internship program may apply at any Career Services office. Among other requirements, applicants for the leadership program must reside in the tribe’s 14-county jurisdiction and have a GPA of 3.0 or higher for the current school year. Two letters of recommendation from school administrators, a school counselor and/or former employers are also necessary. 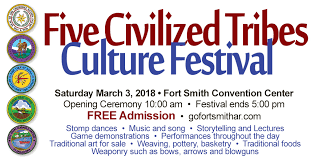 A day of traditional native art, music and more may be experienced at the Five Tribes Culture Festival on March 3 at the Fort Smith Convention Center. The special event is part of the city’s Bicentennial Celebration and showcases the rich and colorful cultures of the Five Civilized Tribes and their historical relationship with Fort Smith. Cherokee demonstrations include pottery, painting, shell carving, beadwork and basketry. Cherokee performances include the Cherokee National Youth Choir and Cherokee National Treasure Tommy Wildcat on the traditional flute. Guests are also invited to watch special screenings of “Osiyo, Voices of the Cherokee People” and explore an exhibit honoring Cherokee women who have changed the world. The Five Tribes festival begins at 10 a.m. with opening remarks by Fort Smith Mayor Sandy Sanders. The family-friendly event runs until 5 p.m. and features live performances, lectures and cultural demonstrations throughout the day. Guests can also sample traditional foods. The event is open to the public and free to attend. The Bicentennial Celebration year has been divided into four quarters, each with a different theme and corresponding events. The first quarter’s theme is Arts and Culture, which runs through April 2018. A series of events are being held to entertain, educate and enlighten area residents about the culture and lifestyles of Fort Smith throughout history. For more information about upcoming events, please visit www.GoFortSmithAR.com. The Fort Smith Convention Center is located at 800 Rogers Ave.
“It was such an honor to meet with these young women who already are making a positive impact in our district and for our state,” Bennett said. 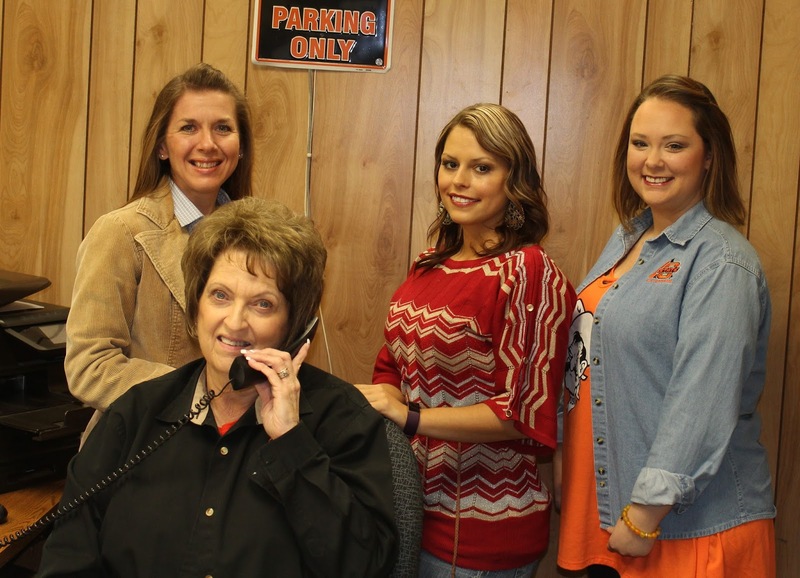 Vian School District voters will go to the polls March 6 for the Vian Special School Election. Vian School Superintendent Victor Salcedo said the ballot has two proposals, for a total of $650,000. 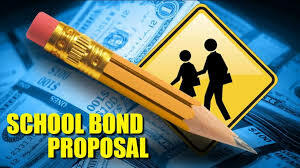 If approved the bond issues will be used to purchase vehicles for the school. The bond, if approved, will be for five years, Salcedo said. The bond would add $5.66 to property taxes, he added. Salcedo said the school wants better buses for safety’s sake. “We try to make sure our kids, our staff and faculty have safe transportation,” Salcedo said. - Early voting will be available at the county election board office from 8 a.m. to 6 p.m. Thursday (March 1) and Friday (March 2). - Those who became physically incapacitated after 5 p.m. Tuesday (Feb. 27) still can request an emergency absentee ballot. Those who might qualify for an emergency absentee ballot should contact the county election board office at 918-774-2614 as soon as possible for more information. was served at a Gore home on Friday. One female was arrested at the home. 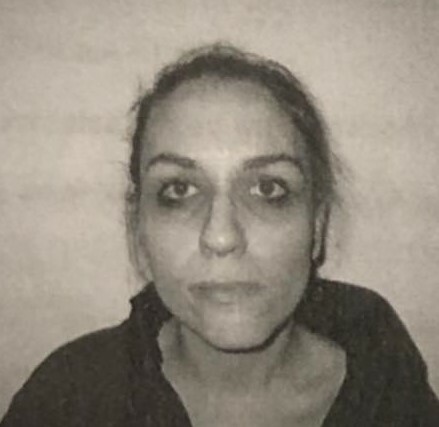 A Gore woman was arrested Friday after Sequoyah County deputies and investigators conducted a drug search at a Gore home. Brittany Poindexter, 27, of Gore was arrested and booked into the Sequoyah County Jail in Sallisaw on charges of trafficking a controlled, dangerous substance, possession of schedule narcotics without a valid prescription, possession of firearms in commission of a felony, being a convicted felon in possession of firearms and three counts of child endangerment. Poindexter is being held without bond. 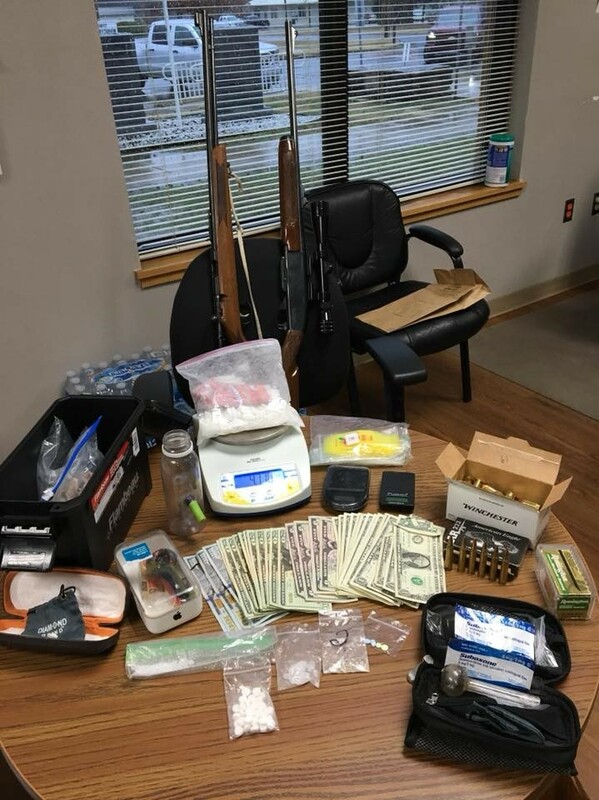 Sheriff Larry Lane reported when officers served the search warrant they recovered a large amount of methamphetamines, pills, digital scales, packaging materials, cash and two firearms. Lane applauded the good work of Deputies Thomas Stafford and Galen Irvin, and Investigators Dwayne Frizzell, B.R. Rutherford and Christian Goode. “These guys didn’t let the heavy rain and cold weather slow them down, these guys are relentless and will continue to bust these drug dealers and thieves,” Lane said. by (left) Miss UAFS 2017 Logan Moore and Miss Arkansas Maggie Benton. 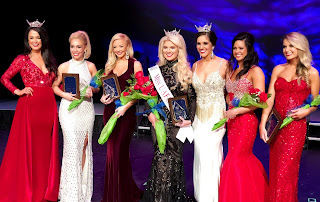 Top 5: (Left to right) Miss UAFS 2017 Logan Moore, Allison Thompson, Niki Waters, Elizabeth Spencer, Miss Arkansas 2017 Maggie Benton, Mary Beth Andrews, and Tori Seaman. In a competitive pageant that awarded more than $18,000 in scholarships to winners among its 13 contestants, it was Elizabeth Spencer of Fort Smith, formerly of Sallisaw, who took the crown of Miss UAFS 2018 at the University of Arkansas - Fort Smith’s scholarship pageant on Saturday evening. 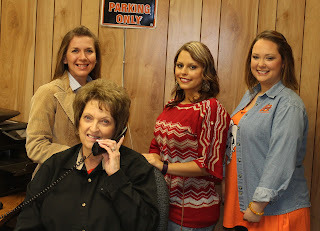 Spencer, 20, is a nursing major and the daughter of Dwight and Cherie Spencer of Sallisaw. She sang “Smile,” for her talent and is promoting the platform “Safe and Sound: Healthy Habits for Life.” She will represent UAFS at the Miss Arkansas Pageant this summer in Little Rock. 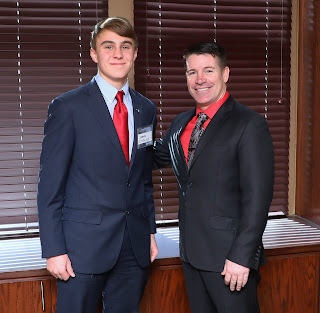 In addition to winning the pageant, Spencer was also the recipient of the Logan and Zane Moore $500 nursing scholarship given during the awards ceremony at the event’s finale. Spencer concluded, “Being Miss UAFS is as much a job as it is an opportunity. I appreciate the opportunity to be a representative for the university." She will now prepare for the Miss Arkansas Pageant to be held June 9 through 16 in Little Rock. That pageant is part of the Miss American System, Spencer said. -First runner-up: Niki Waters, 20, of Booneville, daughter of Steve and Kim Waters of Booneville. Waters also won the Vocal Artistic Expression Award. -Second runner-up: Mary Beth Andrews, 19, of West Fork, daughter of Stan and Kristi Andrews. Andrews also won the Academic Excellence, Non-Vocal Artistic Expression, Lifestyle and Fitness, and Spirit of Miss UAFS awards. -Third runner-up: Allison Thompson, 21, of Fort Smith, daughter of Regina and David Thompson of Fort Smith. Thompson also won the Interview Award. -Fourth runner-up: Tori Seaman, 20, of West Fork, daughter of Brett and DeAnne Seaman of West Fork. 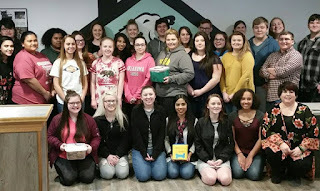 Seaman also won the Audience Appeal Bucket Award and the Arkansas Blood Institute Matching Scholarship Award given to the contestant who had the most blood donated in her name. Additionally, the winner of the Audience Appeal Award was Alesha Thach, 18, of Fort Smith, daughter of Nguyet Than and Tan Thach of Fort Smith. Tori Easton, 20, of Fort Smith, daughter of Doug and Robyn Croop of Fort Smith, won the Miss Congeniality Award. Judges determined the winner and runners-up based on five areas of criteria: talent, interview, lifestyle and fitness, eveningwear, and the contestant’s response to their on-stage question. The event was held at the ArcBest Performing Arts Center at the Fort Smith Convention Center. 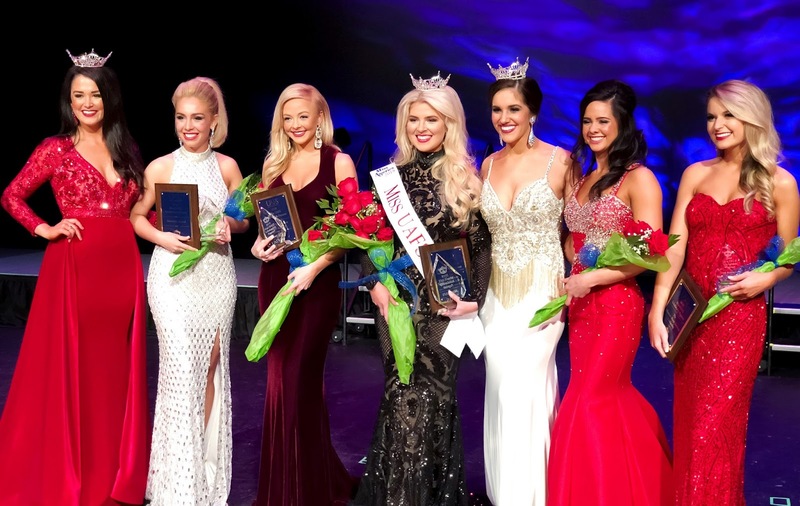 The pageant awarded more than $18,150 in cash and scholarships - in addition to prizes valued at more than $8,000 – during this year’s pageant. 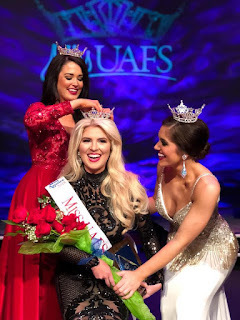 For winning Miss UAFS, Spencer received a two-year scholarship to UAFS valuing $7,000, a cash scholarship valuing $2,500 and a necklace from The Jewelry Store worth an estimated $2,500. Entertainment was provided by the UAFS Jazz Band and Jazz Catz under the direction of Don Bailey; special entertainer Tommy Dobbs; and Miss UAFS singers Landon King, Brian Gary, Sarah Bridges, Winston Turner, Ashley Hill and Aspen Knight. Miss Arkansas Maggie Benton also performed during the pageant. The pageant chair is Stacey Jones of Fort Smith, associate vice chancellor of campus and community events at UAFS. Jones is also producer for the Miss Arkansas Pageant. Miss UAFS is a preliminary to the Miss Arkansas Pageant. The winner of Miss Arkansas will then go on to compete in the Miss America Pageant. Contestants will compete in five events: evening gown, interview, physical fitness and swimsuit, talent, and on-stage question and answer. Scholarships will be awarded to Miss UAFS, runners-up, and various category winners, such as congeniality, GPA and interview. 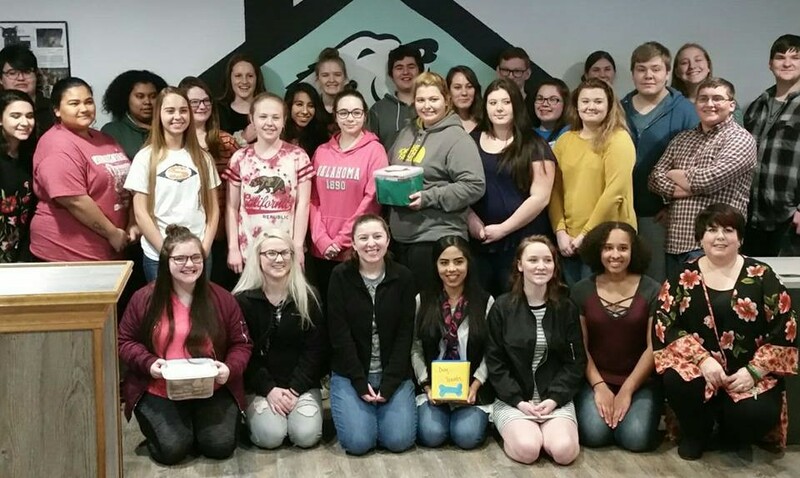 The Sallisaw High School Family and Consumer Sciences class recently delivered 17 dozen home-baked doggie treats to the Sallisaw Animal Shelter. When the 29 high school students arrived, they were greeted by Freeman, Lewis Brown, Ro Poindexter and all the dogs. They received information about the facility and then went on a tour. Sequoyah County Commissioners reported recent heavy rains have damaged county roads, but few had to be closed. Watts said he did have to close down a few low-water crossings. He fears that the additional rain predicted by forecasters may cause more problems. “We can’t take much more,” he said Monday. District 3 Commissioner Jim Rogers said on Monday that his roads also remain open. District 2 Commissioner Steve Carter said he had to close two roads – the low-water crossing south of Sallisaw on Drake Road and Buzzard Roost near Lake Tenkiller. The Oklahoma Department of Transportation (ODOT) reported on Sunday that State Highway 80 is closed in Cherokee County from State Highway 51 at Hulbert at the Fort Gibson Wildwood Recreation area south to State Highway 251A. 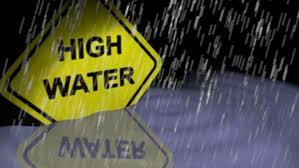 In LeFlore County, U.S. Highway 270 is closed between Heavener and Wister. A 34-year-old Sallisaw man was charged Wednesday in Sequoyah County District Court with possession of forged notes. 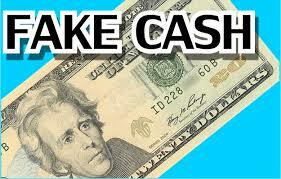 Timothy Sean Thornell is accused of having in his possession 15 $100 forged bills. The police report filed with the charges alleges that Thornell had the forged bills in his possession when stopped by a Sallisaw police officer on Feb. 11 while bicycling in Sallisaw. According to the report, Thornell said the bills were play money obtained at a Sallisaw store, but officers found no play money matching the bills at the store. Thornell entered a not guilty plea to the charge on Thursday, and his next court appearance is set for March 14 on Associate District Judge Kyle Waters’ felony disposition docket. On Friday he was appointed an attorney after his application alleging he had no money for his defense was approved. A 70-year-old Sequoyah County man was rescued from the flood waters in Sallisaw Creek, south of the Low Water Bridge on Drake Road, south of Sallisaw, on Wednesday. 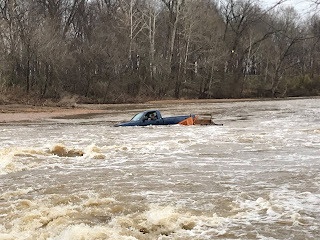 Steve Rutherford, Sequoyah County Emergency Management director, said the call came in at about 11:50 a.m. and the McKey, Vian, RFD 1 and Sallisaw Fire Departments responded and were able to get the man out of his pickup truck and back to land using the boat provided to the McKey Department. The man was driving west on the county road in a pickup and pulling a small flatbed trailer, Rutherford said, when he tried to cross Low Water Bridge and he, the truck and trailer were swept off the bridge. The man was treated at the scene by Pafford EMS. “That water was cold,” Rutherford said. He added the man called for help on his mobile phone. Wednesday’s rescue was the first this year at that Low Water Bridge, and fire departments had two or three water rescues at the same bridge last year, Rutherford said. “The Sequoyah County Commissioners have plans in the process to improve that road and bridge,” Rutherford said. In Adair County, a 53-year-old Stilwell resident drowned Wednesday when his vehicle was swept off a low water bridge on East 830 Road, three miles east of Stilwell. Victor French was pronounced deceased at the scene by Pafford EMS, the Oklahoma Highway Patrol reported. That incident is still under investigation. Carl Albert State College (CASC) employees Jaime Henson, Daniel Smith, Kristen Peerson, and Terri Cox were all recognized for completing the Leadership Sallisaw Program at the annual Sallisaw Chamber of Commerce Awards Banquet Saturday evening. 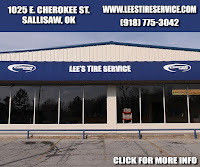 The program is sponsored by the Sallisaw Chamber, and provides a comprehensive view of the county as a whole. CASC instructor Bryan Warner was the recipient of the Chuck Sainer Community Spirit Award, and also served on the 2017 Chamber of Commerce Board of Directors. Warner said he was very humbled to receive the award, and was proud of the CASC employees who completed the leadership program. The eagles have landed…but not on the moon. 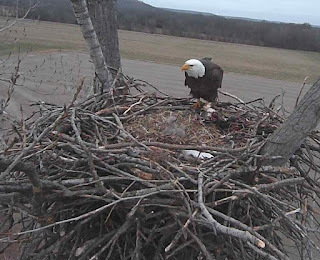 Two baby eaglets have hatched at Sequoyah National Wildlife Refuge, south of Vian. 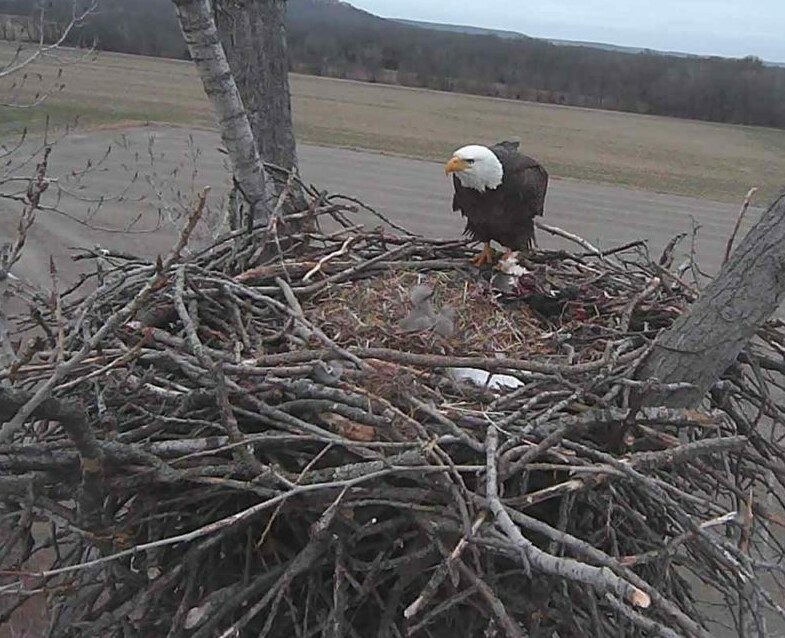 Their progress may be monitored by those interested through the eagle cam maintained by the Sutton Avian Research Center and streamed on the wildlife refuge website. The babies hatched in mid-February, according to information on the site. According to the research center, Southern Bald Eagles typically lay eggs during the months of December or January, and incubate the eggs for about 35 days before they hatch. After the eggs hatch, the real work begins with both adults providing continual care for the young over the 11 to 12 week period until the young birds fledge (or leave the nest). The Sebastian County Sheriff’s Office, Fort Smith Police Department, Greenwood Police Department, and Arkansas State Police participated in a joint investigation into the distribution of methamphetamine in the area, and arrested a Muldrow man on Tuesday. Zephyran Hayes, 39, of Muldrow was charged with trafficking a controlled substance, possession with intent to deliver a Schedule I/II narcotic, possession with intent to deliver a Schedule VI narcotic (marijuana), possession of drug paraphernalia, and maintaining a premise for narcotic sales. 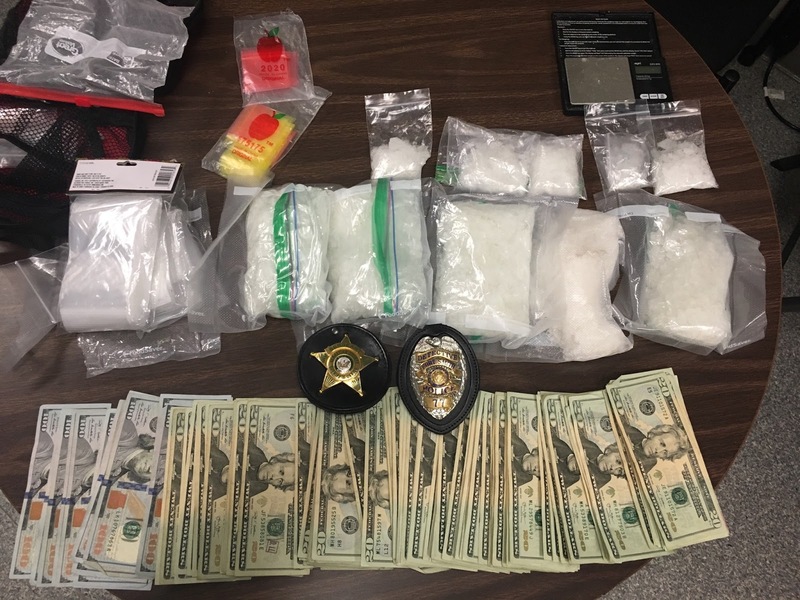 The investigation resulted in the seizure of 2.8 pounds of methamphetamine, $4,300 in cash, scales, baggies, and an automobile. Hayes is also wanted out of Sequoyah County on drug-related charges, authorities reported. Hayes is being held in the Sebastian County Detention Center with no bond. State Rep. John Bennett this month met with constituent James Limbaugh of Sallisaw at the State Capitol. “It was an honor and a privilege to have James visit at the Capitol,” Bennett said. Bennett represents Oklahoma House District 2. He can be reached at (405) 557-7315 or John.Bennett@okhouse.gov.